Gratitude is a funny thing. There is usually a reason to give thanks, but if it doesn’t hit me over the head, it tends to go under the radar. I am very lucky, for example, that my son, Noah, has all four of his grandparents in his life. However, I tend to forget this and can feel like my husband and I are going it alone. But when my son returned from camp and I helped him unpack, I found that we weren’t the only ones writing him letters. I was especially touched to see the cards from Noah’s “Nanie” and “Popie”, my husband’s parents, who live at some distance from us. I felt their presence as I read their letters, with updates about their lives, and questions for Noah about his daily experiences in camp. As I write this today, Noah is spending the morning at his other grandparents, my parents, who live about a half-hour away. “Gram” and “Pop” have developed an easy relationship with Noah, and are able to see him and accept him in a way that is sometimes difficult for me. They are also very glad to be able to give me, and my husband, some much-needed down time. Noah’s grandparents have helped us in so many ways. And, yet, I know that they have had their own struggles. This has not been an easy journey for my husband’s parents or for mine. The diagnosis of autism was almost unheard of when they themselves were parents of young children. I have no idea how Noah’s grandparents must have felt when things began to unravel and his difficulties became apparent, when he seemed to have trouble hearing us, and when he stopped saying the few words that he had used before. When the autism diagnosis came, we were too wrapped up in our own fears and grief to think about our parents. But Noah’s grandparents, like so many others, struggle with the puzzle of autism, worrying both about their grandchild, and the effect the diagnosis will have on the entire family. Grandparents are often perplexed about the best way to spend time, or set limits, with their grandchild. They feel fear for the future. They want to find ways to support their children and their other grandchildren. When I began to lead support groups for parents, I received an email from a grandmother asking about groups for grandparents. That email inspired me to begin Grandparents Surviving and Thriving, a support group for grandparents. The group provides a place to share concerns and ideas. 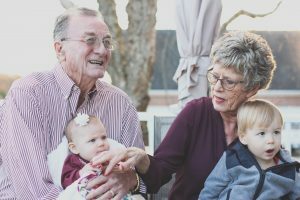 Grandparents talk about ways to be supportive to their children, and how to spend quality time with their grandchildren. They exchange strategies to deal with meltdowns and safety concerns, and look for ways to enhance their grandchildren’s lives. There is a great comfort to us parents in having grandparents who care, in the knowledge that someone else is sharing our burden (whether we remember it or not). Grandparents can truly be the unsung heroes for parents who have a child with special needs. They can provide some relief when we parents are at our wits end, providing a meal or just a few hours of babysitting. Not everyone is lucky enough to have this support, I know. But for those of us who do, it is an immeasurably reassuring treasure, one to be grateful for.